Monday August 8th was an early morning for us. We were heading to Isle Royale National Park, an island in Lake Superior, and we had a 7:30am boat to catch at the docks in Grand Portage, Minnesota. Isle Royale is accessible via boat or seaplane, and there are few different departure points in Minnesota and Michigan (Isle Royale is Michigan land). We opted for the Voyager II out of Grand Portage, which is about a two-hour trip. The ride out was sunny and smooth, and I passed some of the time chatting with one of the boat staffers who lived in the area. He shared some facts about the lake and several stories about the odd, unexplainable, “supernatural” events he’d seen out on the water. Definitely an interesting guy! 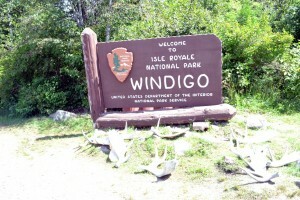 Windigo was the first stop on Isle Royale, which is where we disembarked. 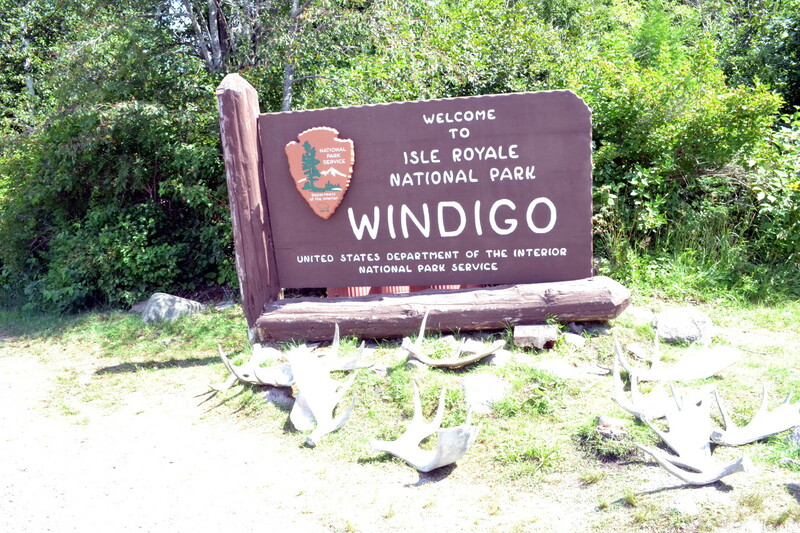 Even if you are heading to another stop on the island, all passengers are required to disembark at Windigo to hear a safety talk and acquire camping permits at the ranger station. From May to September the Voyager II goes out to the island on Monday, Wednesday and Saturday and returns to Grand Portage on Tuesday, Thursday and Sunday. So, unless you’ve arranged some other form of transportation back to the mainland, you’re on the island for a minimum of one night. 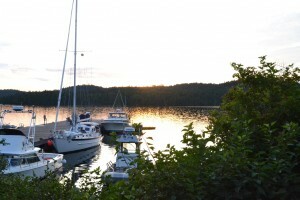 Many people stay longer and trek the length of the island, from Windigo to Rock Harbor. We were not in for that kind of an undertaking and instead chose to camp in Windigo and stick to day hikes. As it turns out, there are some basic camping cabins (small structures with screens) about .3 miles from the ranger station, so the trek to camp was a short one. We opted to set up our tent inside the shelter for an extra layer of protection against the bugs. There is a store in Windigo where you can buy food, basic supplies and souvenirs. While you certainly won’t starve in Windigo, if you want anything more than yogurts, bagels and other snack food, I’d suggest bringing your own supplies. Most campsites on Isle Royale do not allow fire pits, so we opted to leave our cooking tools at home and purchase ready to eat food when we were there. We ended up cobbling together some odd meals, but they worked for us. The first day we took our lunch with us to Grace Creek Overlook, a 3.8 mile round trip hike on the Feltdmann Lake Trail. 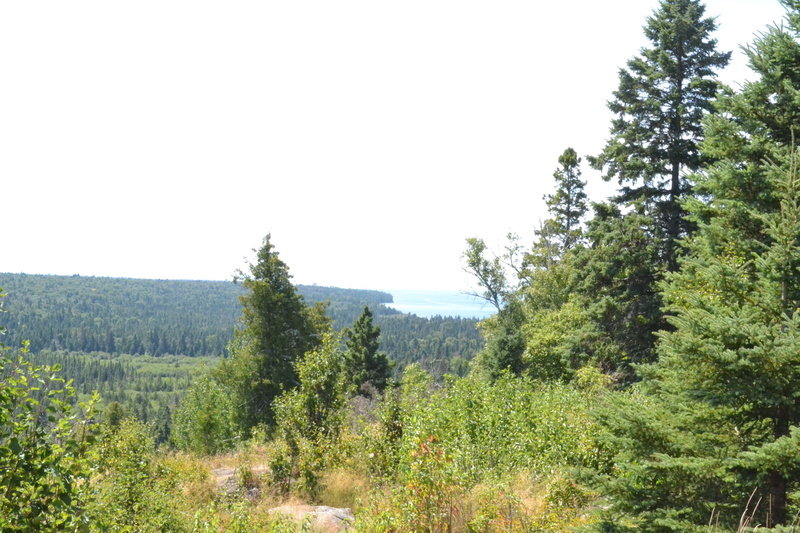 We feasted on tuna fish, bagels, cheese and hardboiled eggs while sitting on a large rock overlooking Lake Superior and a smaller inland lake – a lovely spot. View from Grace Creek Overlook. Later that day we mustered the energy for a longer hike on the Minong Ridge Trail. While the trail in its entirety is quite long, we opted to take it 3.5 miles out and 3.5 miles back – a seven mile round trip hike is plenty for me, thanks! The scenery changed some along the way, as we tramped through forests and then up into rocky clearings that provided views of the lake in the distance. It was also berry season while we were on the island, and we were encouraged to eat the wild raspberries and blueberries we found on the trail. The raspberries were more plentiful, at least in the areas we frequented, and it was fun to pick them straight off the vine and enjoy some tasty morsels during the trek. After a seven-mile hike we were both ready for a meal and some downtime. We took our mishmash dinner down to the dock and ate there, enjoying the light cast by the lowering sun and the slight breeze that helped keep the bugs away. The next morning, we awoke to find a pair of moose grazing in the river opposite our campsite – a very cool way to start the day! There are supposedly around 1,200 moose on the island, and we had been hoping to spot some. That morning we did a quick self-guided nature walk that was close to the ranger station (about one mile total) and I sat in on a ranger talk about the life of a moose. Did you know that male moose grow a new set of antlers every year? The antlers are a display of their health, and they use them to attract lady moose – the healthier the antlers, the healthier (and more attractive) the male. Antlers are the fastest growing tissue on a mammal, and amazingly they can grow about an inch every day! The Voyager II came to collect us for the return trip around 1:30pm central time. Time zones are a bit confusing on the island, as phones can pick up signals from Michigan cell towers in eastern time or Minnesota towers in central time. The boats run on central time and the seaplanes run on eastern time, so make sure you know which time zone your phone is picking up.